"I even love going to work now! The Personal Celebration program helped me put my whole life in perspective. For the first time ever I feel that I have balance and purpose. I’m out of the rat race." What if I send a group of friends to deliver empowering and moving messages meant for you? And, when they leave, you will feel on top of the world, A-Number-One! That would be great, wouldn’t it? I can arrange that for you through the magic of audio. 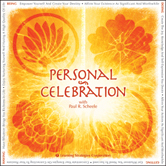 Paul R. Scheele developed a uniquely powerful set of audio sessions called the Personal Celebration Series, and they are emotionally satisfying and soothing for the soul. On the last day of a seminar I took a few years ago, the instructor asked us to imagine a visitor—a visitor with a very important message for each of us, one that would have intense personal meaning. I imagined a friendly visitor, and what he told me almost knocked me out. I felt wonderful, peaceful, and oh so confident in myself. The instructor divided us into two groups, the blues and the reds. All of us blues stood with our eyes closed while the reds came to us one by one, gently whispering their private messages. The messages were moving, the voices tender, and the people sincere. Tears flowed from my eyes. Every cubic inch of my body came alive with warmth and excitement. I felt zeal and enthusiasm coupled with a tranquility unlike anything else I had experienced in all my life. When I flew back to Minneapolis, I met with Paul Scheele, my business partner and co-founder of Learning Strategies Corporation. I told Paul about my experience. We talked for hours about how we could deliver this same incredible experience to people like you. We invited a few dozen of our favorite customers and friends to join us in the recording studio. We went into one of the best studios in the world, Paisley Park, owned by the rock superstar Prince. Paul led our friends through deep meditation to create personal statements as important to them as those statements we created in the seminar I attended. He then led each person to "Mr. Mikey," a styrofoam head with $4,000 microphones for ears. This helped create a three-dimensional, real life sound that is magical when heard with stereo headphones.